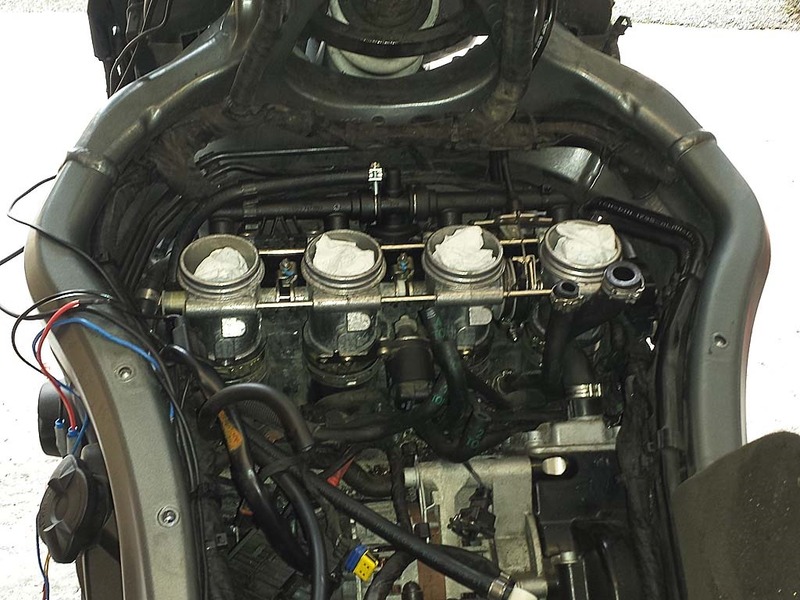 Well a nice dry day with little wind came around so I decided to pull the BMW out of the garage and have a go at swapping out the throttle bodies, to see if that would cure the sticking throttle issue. I stripped the side fairing panels and tank panels off and then removed the fuel tank from the bike. I then had to remove the battery and battery holding bracket that is attached to the frame. I then removed the two air inlet pipes that also hold an air filter each. I could then have a go at removing the airbox. 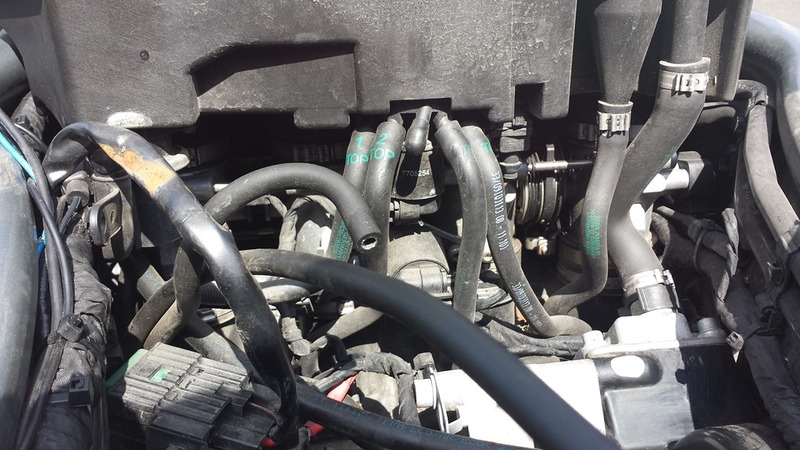 I first pulled off the small pipes to the airbox, I then had the pleasure of removing the spring clips to 3 other slightly larger pipes and then the 4 spring clips to the throttle body outlets. I got a set of pliers off Ebay that did the job of making getting them undone slightly easier. I then removed the wiring plugs to the sensors on the airbox. After all that I was finally able to remove the airbox assembly from the bike. At this point I could now see into the throttle bodies and upon activation of the throttle I could see that yes they weren’t closing fully and sticking. They did look dirty and a bit gunked up so I tried cleaning them first but that made no difference. So I was resigned to having to remove them from the bike. I first vacuumed and cleaned up any crap around the engine to make sure nothing could fall down one of the inlets. I then disconnected the throttle cables at the twist grip and then fed them back inside the frame so they could come out with the throttle bodies. I then removed the sensor cables to two of the sensors, the other ones I would have to pull the throttle bodies up to get at. I then released the 4 large spring clips at the engine inlets and then pulled them up slightly. While doing this a glided some kitchen towel into each of the 4 inlets to prevent any debris falling down them. 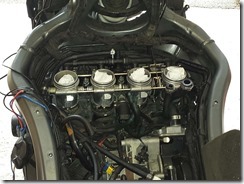 With the inlets protected I was able to manoeuvre the throttle bodies about to disconnect the 4 fuel injector plugs and the other sensor underneath. Once they where removed I disconnect the throttle cables and checked there operation. You could see they where sticking but it was obviously internal and not fixable. Fortunately the pair I got off Ebay worked perfectly so I decided to install them. I changed over the sensors on the bodies as I knew non of mine where faulty and I didn’t want to remove them again for a faulty sensor. I reinstalled the throttle bodies and cables and activated the throttle. There was no notchy feeling anymore and the throttle valves opened and shut perfectly. I then put the bike back together again and then the moment of truth came. The bike eventually started after the fuel got through, I suppose I should of primed the system some how first. Everything worked perfectly and the throttle now seemed more responsive and when shutting it off the bike stood on it nose more. I will have to change my riding style now as I have obviously been riding to the sticking issue. Now that they are fixed I can look at trading in the bike for a newer one.